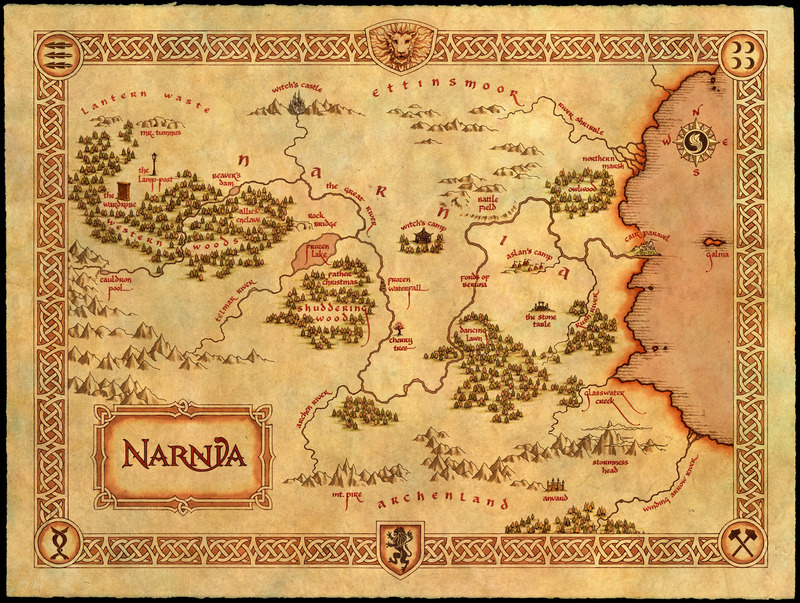 Today we pay tribute to the map of the country of Narnia. This is the setting for the Chronicles of Narnia, which was one my favorite book series when I was growing up. Three of the seven books have been made into movies, and the future is uncertain for the remainder of the movies, but I hope they get made eventually. It was a fascinating, engrossing world, which is full of metaphor and meaning. C. S. Lewis is, in my opinion, one of the most talented writers of the 20th century, and I’ve read nearly every book he’s ever written. He also has a science fiction trilogy for adults, but the Chronicles of Narnia can be enjoyed by both children and adults. I think most people, myself included, are most familiar with the events of “The Lion, the Witch, and the Wardrobe”. In that book, four children enter a wardrobe in their house and find a strange world on the other side, which they learn is called Narnia. You can see where they first enter the world in the top left of the map, marked “The Wardrobe”. The lamp-post nearby is another famous landmark of Narnia, having been created at the beginning of the world when the White Witch threw an iron bar at Aslan. The iron bar became a lamp-post which continued burning brightly without need for fuel. In the book, the lamp-post is where Lucy, the youngest girl, meets Mr. Tumnus, whose home can be seen north of the lamp-post. Also nearby is the beaver’s dam, home of the beavers who befriend the children in the book. Looking beyond that corner, we can see more important landmarks, such as the Witch’s Castle, the Battlefield, and the Stone Table where Aslan was taken to be executed by the Witch. We can trace all the events of the series from this one map, and each place is imbued with a certain emotional dimension as we recall the scenes that happen there. I think this is a very well-made map, because the style harkens back to an earlier time period of magic and mythology, and the names of places and accompanying pictograms evoke a sense of foreboding. I start to wonder, though, what lies beyond the borders of Narnia. In the south is the mountainous country of Archenland, but what’s south of that? How about the eastern ocean… is there land on the other side? And the question most exciting for a cartographer: Is there still unexplored territory out there somewhere? Apparently, there are names of many cities and countries beyond Narnia, although the exact locations of some of these places is hazy. Additionally, the ocean continues to the east until it meets the sky. To my surprise, Narnia is actually flat. I wonder how this would be in real life. Would one walk to the border and be stopped by an invisible barrier? Or fall off? Or be swept up into the sky? Personally, I wouldn’t be convinced that the world was flat and self-contained. In my book the Map of Daggers, Zinke the Cartographer lives on an island which people believe to be the whole world. Sail too far away from the coast, and one may disappear forever into the Mist. But he, like I, would not be convinced. There has to be something more out there, he would argue. It’s the endless drive for discovery, after all, that defines us as humans. 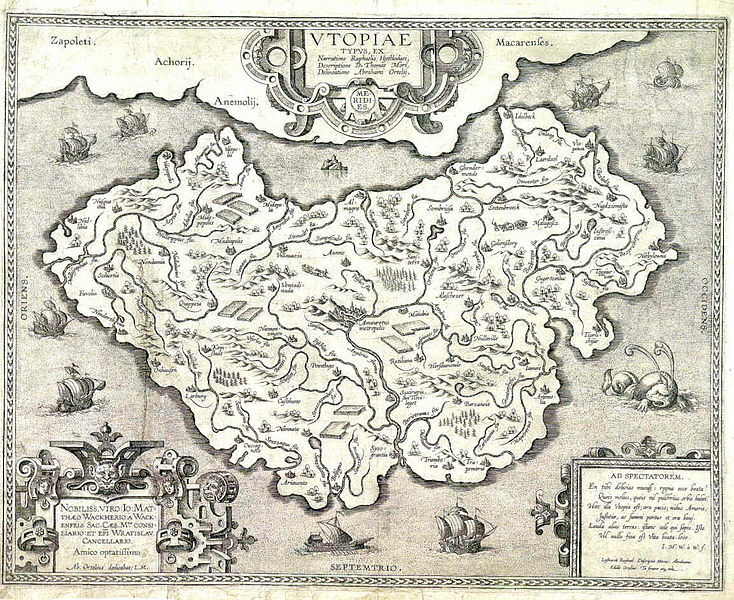 The word Utopia was coined by Thomas More in 1516, when he published a book about a fictional island which the narrator describes as the perfect society. Utopia means either “no place” or “good place”, indicating an ideal system which is unattainable in the real world. More used his description of the political system of Utopia to point out flaws in the early modern European system. In much the same way, utopian and dystopian fiction today functions to highlight problems in our current society by describing a fictional paradise or nightmare (for example, the Hunger Games). The island of Tinggo that I’ve created also serves to critique certain aspects of our society and mankind in general, but it’s more of an adventure story than political philosophy. By More’s account, Utopia sounds much like communism. The government undertakes a great deal of central planning, even mandating how many households can be in a city and how many adults can be in a household. Population is kept even by redistributing people between households and sending people to the mainland if it starts to get crowded. Utopia has no private ownership, and all citizens must farm for two years and then choose a profession (such as weaving or masonry). More seemed to regard the obsession with gold as a major problem in European society, because it led to theft and war. In Utopia, to counteract this impulse, gold is used for chains on criminals and chamber pots. I have to admit that More was pretty creative in coming up with this solution, though it would never work in real life; men always seem to find something to kill and rob each other for. Utopia also has no lawyers, because the law is simple enough for all to understand. Hooray! However, it is not exactly clear that More was describing a society that he wished Europe would become, because some of the aspects of Utopia contradicted his own beliefs. More was a devout Catholic, but Utopia has married male and female priests and allows divorce. On the other hand, the punishment for adultery is enslavement . It is interesting to note that Utopia is tolerant of all religions (except for Atheists, although they are not forced to convert, so that’s a lot more tolerant than some European countries at that time). Although Utopia could be considered a political criticism of England, More was an influential figure in the government, serving as Lord Chancellor. In later life, however, he would be executed by Henry VIII for refusing to acknowledge Henry’s role as head of the Church of England. Unfortunately, More didn’t live long enough to see the religious tolerance of Utopia catch on in the real world. What do you tend to see most often when you look at clouds? Rabbits? People’s faces? For me, it’s geographical features like islands and continents. You could say I tend to have maps on the brain. It makes sense that we tend to see certain things everywhere we look if those things are important to us. When I was a kid, it was often the outline of the continent of Europe, as I dreamed about the day I would visit it. Sometimes I would also see the east coast of the U.S. and try to find my home state of Connecticut within the wisps. As my travel expanded to other parts of the world, like Southeast Asia, I started to see those landforms as well. A similar phenomenon probably happens to Zinke, the main character in my book, Map of Daggers. A cartographer by profession, he spends all day looking down at maps, so that when he finally looks up, I’m sure he sees them in the sky too. In the book, there is another character called Drachmus who is the military commander. He has a typically aggressive, warmongering personality. When he looks up, he sees armies of clouds charging at each across the sky. Another character trains super-intelligent cats. When she looks at the clouds, she sees her beloved felines playing. They all bring their personalities into their perspective, as the content of what they see is influenced by what they most want to see. This isn’t part of my book yet, but I might find a way to work it in, because it’s an interesting way to develop a character and show where his or her passion truly lies. Maybe another military leader looks up at the clouds expecting to see charging armies, but instead he sees the face of his girlfriend whom he misses, revealing a softer side to that character that we didn’t previously know. What do you see when you look at the clouds? There has been a lot of discussion over the years about how earthquakes or global warming or some other catastrophe which is currently in vogue (zombie apocalypse?) could cause California to break off from the rest of the U.S. and become an island. But did you know that California already was an island in the 17th century? Map of California, circa 1650; restored. Sounds crazy, right? Well, that’s because it’s not true. It was a popular misconception which appeared on maps from the 17th and 18th centuries and was not finally put to rest until the late 18th century. 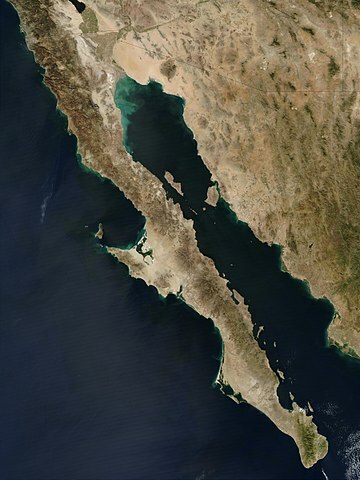 A satellite view of Baja California peninsula and the Gulf of California. If an explorer could chart the shape of the peninsula, couldn’t he have sailed north to verify whether it connected to the mainland? The surprising thing was that the first explorers to the region in the 16th century did just that. Maps published in Europe during this time show California as a peninsula, not an island. And yet, contrary to what we would assume, cartographic knowledge of the region suddenly took a giant step backwards in the following century. 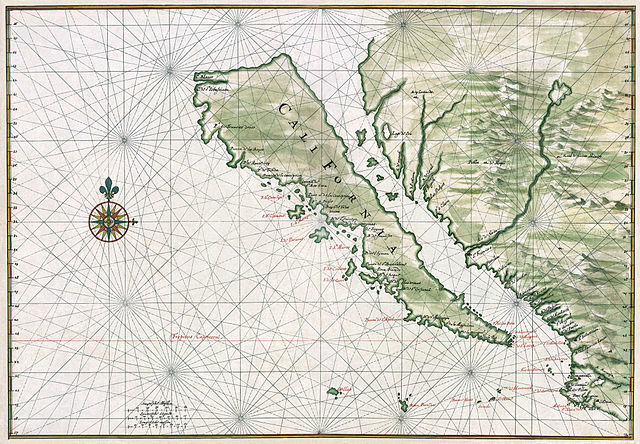 Starting in 1622, reports from Spanish and Dutch explorers began describing California as an island, and other writers and cartographers copied them until this distorted view of the area actually usurped the more accurate one from earlier. Of course, it was very difficult for the average person during this time to go and check out California for themselves and determine if it was being accurately drawn. A lot of what people see on a map they just accept to be true even if they haven’t personally seen it, and this is still true today. But the most perplexing part is that the error continued to be reproduced even after explorers tried to sail around California and realized that it was not an island. And even as more accurate maps were published showing California as a peninsula again, some maps continued to show it as an island. By the 1770s, it had officially been confirmed that California was not an island, although a curious map from Japan still showed it that way as late as 1865. It took a long time, but at last California was rightly restored to its spot on the mainland (at least until the apocalypse comes). What the island of California teaches us is that misconceptions repeated as truths are very stubborn to die. The best way to really know something is to go and see for yourself. For more information about the “island of California”, check out the wikipedia article (http://en.wikipedia.org/wiki/Island_of_California) and the book “On the Map: A Mind-Expanding Exploration of the Way the World Looks” by Simon Garfield, copyright 2013 by Gotham Books, a member of Penguin Group. This book is a must-read for anyone who loves maps. Monday, April 15, is the day of the Boston Marathon. When I was in college, classes were canceled and we would cheer on the runners as they passed by on Commonwealth Avenue in Newton. At first I wondered why some of the runners looked so ragged, until I realized that by the time they reached Boston College, the runners were on mile 21 of 26. The marathon begins in Hopkinton and passes through several Boston suburbs before heading downtown and ending near the John Hancock Tower in Copley Square. Below is a link to the route from Google Maps, which can be zoomed in. Runners train for months for this marathon, which is more difficult than most due to the presence of many changes in terrain. In particular, around mile 20, just before reaching Boston College, is Heartbreak Hill. It’s not a particularly steep ascent, but it comes late in the marathon when many runners are starting to get fatigued. If they can make it past this point, though, it’s mostly downhill from there to Boston (but they do have to put up with annoying drunk college students yelling at them from BC and BU). Note that the Boston Marathon is basically a straight line from Point A to Point B. It does not loop around, like some other marathons do (e.g., the Hartford Marathon). And in this sense, it stays true to the original marathon from ancient Greece, when a Greek soldier ran the 26.2 miles from Marathon to Athens to deliver a message that the Persians had been defeated. After he told the message, he promptly dropped dead. Luckily, today’s marathon runners put in a little more training than poor Pheidippides. 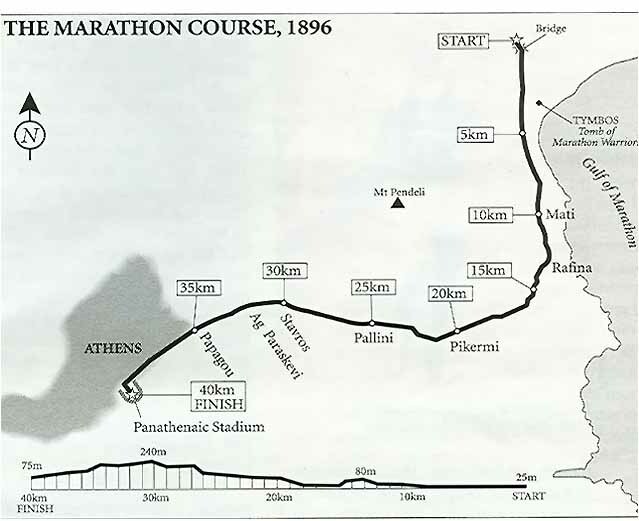 The route chosen for the marathon in the 1896 and 2004 Olympics in Athens is the one below. The reason the route is not straight is that Mount Pendeli is in the way. Pheidippides would likewise probably have gone around the mountain rather than up it. Most of us will probably never run a marathon. But that’s the beauty of maps. We can virtually follow the route and cheer on those who run it without having to break a sweat. And for some, seeing it mapped out and tracing the route with their fingers may give them the confidence they need to start training. The road from Hopkinton to Boston, or Marathon to Athens, actually looks manageable when it’s abstracted as a bold line on a map, with no hint of the physical pains which typically set in during and after such a long distance run. Personally, tracing the route with my finger is enough for me. 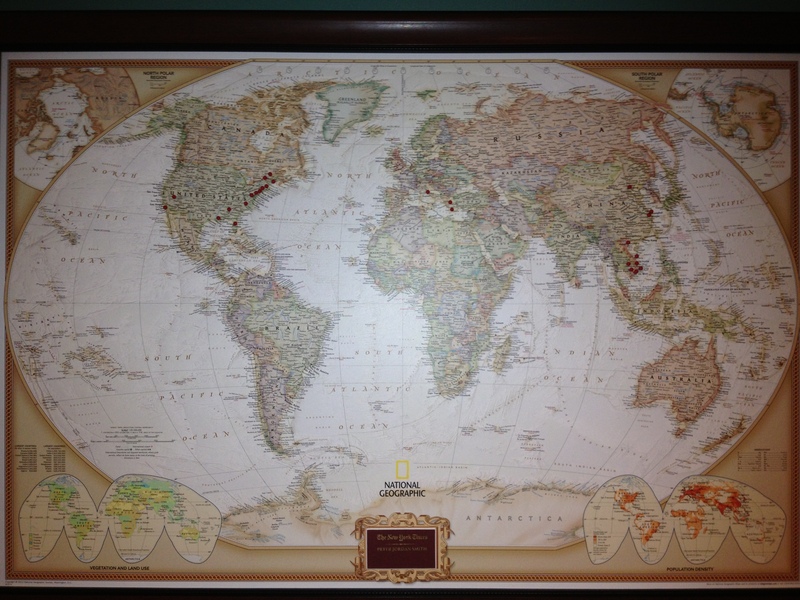 What struck me about this map, and every map on that post, is how they offer a window into that person’s world. We often think of an ideal map as being objective and accurate. And you better hope that a map you take with you on a trip is both of these things. But some maps might serve a different purpose. Maybe they’re meant to tell a story or describe what a city means to a certain individual. With this in mind, I created my own personal map of Connecticut, my home state. 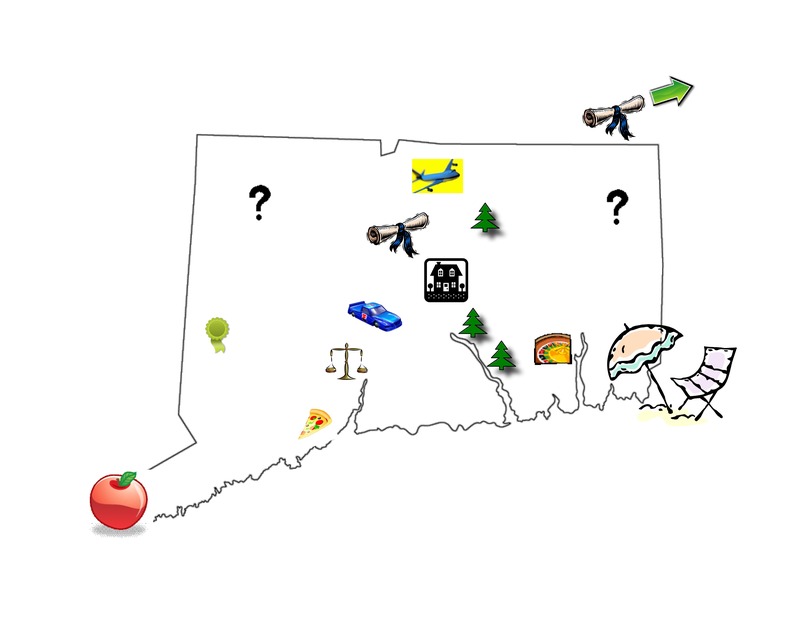 It took me ten minutes with a blank outline of the state and images from clip art, so it’s a bit rough, but hey, it’s my personal map. I encourage everyone to do this, it’s pretty fun! I picked about ten things which meant something to me, in placed them in very approximate locations. In the southwest is the Big Apple (NYC). New Haven, of course, has the best pizza. Above that are scales to represent my law firm, and above that is where I bought my latest car. On the left side is a green ribbon to symbolize the tragedy that happened in Newtown a few months ago. I got my law school diploma in Hartford but my undergrad diploma is off the map in Boston, to the northeast. My favorite beach town of Newport is off the map too, in Rhode Island. Making this map made me realize how much of the state I had no knowledge of. I put question marks up in the top left and top right corners to fill the space. These are mostly rural parts of the state, but I’m sure if the residents of these towns made their own personal maps, these areas would be more filled in. What if you made your own personal map of your city or state? What would it say?